I ran into an interesting problem over the weekend. On Saturday, I had bought Elements External Hard Disk Drive, a 350 GB mammoth just to back up some stuff from my laptop. Aside: Hmm.. backing up for turning your laptop in is no fun. Hate this part of the consulting business. When I switched it on and connected to my laptop, it purred happily and identified itself as D:. 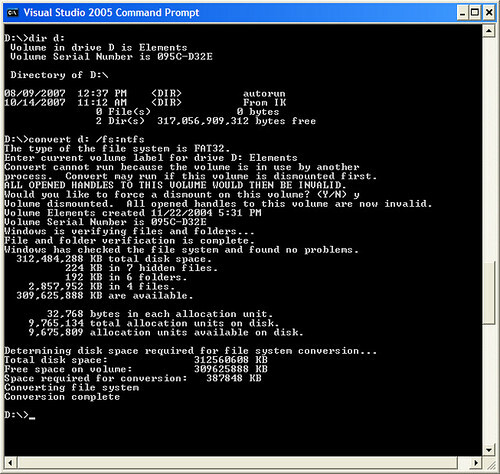 First up was the VS.Net 2008 Beta VPC download. In you go! It copied first two files [base*. *] and choked on the third one, OrcasBeta2_VSTS.vhd, the eleven GB virtual hard disk. The message? Do you want windows to help clean your mess up and free some space?" Not exactly. It was close though for a WTF! Ever had the sinking feeling thinking your newly bought device is just money down the drain? Fortunately, Google bailed me out - as usual - with this information that also lead me here. Well, well, it seems that the file format that HDD came with was Fat32. Surprise, Surprise! Just ran the convert utility to peace of mind. I want to thank the blogger very much not only for this post but also for his all previous efforts. I found www.thinkfarahead.com to be very interesting. I will be coming back to www.thinkfarahead.com for more information. A .Net junkie, Vice President at Hanu Software Solutions Inc., NJ. Bake (?) - A Rake Port in Boo? Google, Where are you taking me today?